You might even have been able to tell from the episode’s title — “Glitter in Their Eyes” — that last night’s third installment of Survivor: Nicaragua was going to be about Marty’s attempt to take down Jimmy Johnson. *It’s interesting and telling that Marty seems to have never considered the potential advantages of this. For instance, if the two tribes merge at roughly equal numbers, and Jimmy’s charisma is able to win over someone from La Flor, it can tilt the balance in Espada’s favor post-merge. Marty, it seems, is thinking even longer-term than that. Marty won himself some dap by revealing to the tribe that he had found the Hidden Immunity Idol, doing so almost begrudgingly on Jill’s counsel. It was a calculated but, from his perspective, low-risk move: Keeping the idol secret only benefits him if he’s on the chopping block, and Marty doesn’t plan on being on the chopping block until after the merge. * It’s also clear that he doesn’t plan on letting anyone else use it anytime soon, but Marty had won at least one fan in his tribe. “That move just strengthened this tribe about five times,” Jimmy T. said. “I was like, ‘What a guy! Way to go, Marty!’ I wouldn’t have done that.”** In the process, Jimmy T. firmly reminded us that Espada is a tribe of the elderly by using “What a guy” and “Way to go” as his primary means of exclamation. * Of course, if someone from Espada turns and lets La Flor know about the HII post-merge, well, it can come back to bite Marty. **He also didn’t mention, at least in the footage we saw, Jill’s role in finding the idol at all. Hmm. Perhaps it was because it was clear that one of the two people I thought should win was going to win. Perhaps it was because the voting went almost exactly as I expected,* from five down to four down to three down to one. Or perhaps it was because I wrote those 2,000 fawning words about the euphoria of a Survivor season finale. *Qualification time: I said “almost exactly.” Even though I said Parvati was the favorite, I thought we would get to a Final Three of Russell, Parvati, and Sandra, and that Sandra would win in that scenario (I thought 4-3-2 before the final tribal and 5-3-1 after it, with JT sticking with Russell. He didn’t.). It started with highlights from the players’ previous Survivor experiences, and what struck me most was the difference in the reactions of Colby and Russell when they each lost. I had forgotten just how likable Colby was on Australia; I mean, he jumped up and fist-pumped the moment he lost because he was excited for Tina! What a guy! 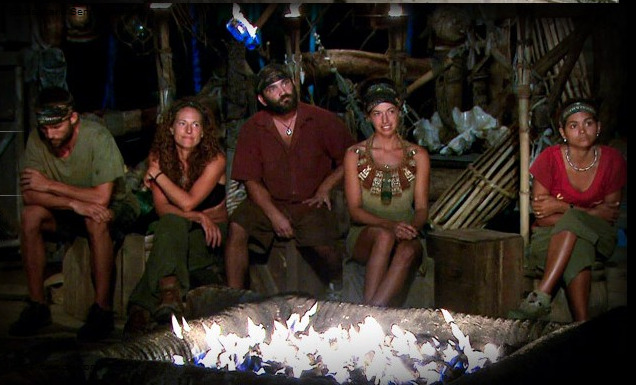 Russell, meanwhile, looked like the sorest loser in Survivor history–a designation he would add to later.